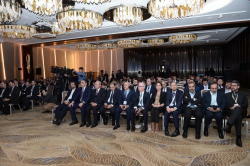 Baku hosted Caspian Innovation Conference for the first time within the framework of 24th Azerbaijan International Telecommunications, Innovation and Technology Exhibition Bakutel 2018 on December 5. 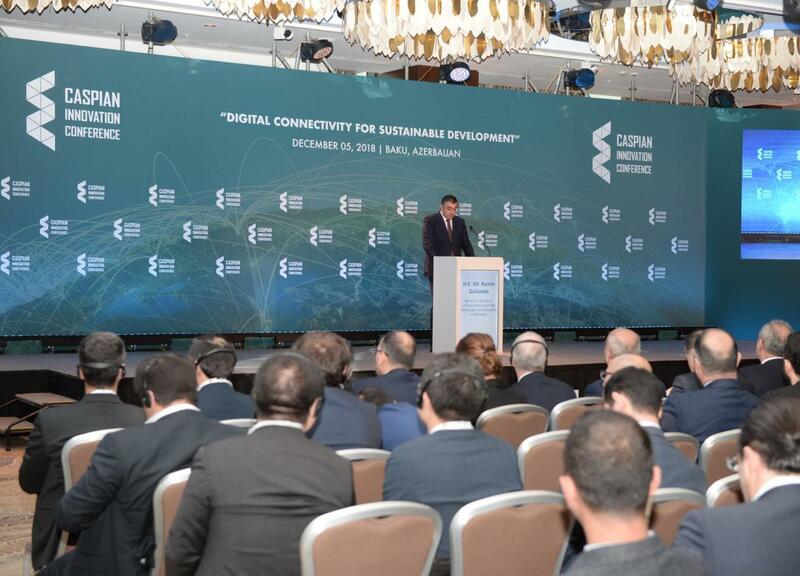 The aim of the conference on "Digital Linkage for Sustainable Development" is to reduce the digital divide, as well as revise digital connectivity for foreign investments and provide business efficiency. The event brings together government officials, industry leaders, representatives of international organizations, including managers of the region`s largest mobile telecommunications and satellite operators. The conference, which plays the role of a regional platform mainly focuses on a such topics as "Broadband Connection", "Artificial Intelligence", "The Internet of Things", "Electronic Services", "ICT Based Start-ups and Innovative Entrepreneurship", "Fourth Industrial Revolution" and others. 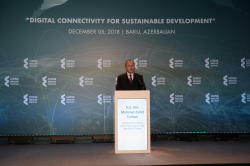 Speaking at the conference, Minister of Transport, Communications and High Technologies Ramin Guluzade noted that until 2020, the frequency range of 700-800 megahertz in Azerbaijan will be reserved for the needs of LTE mobile communication. Technical work on the matter is already underway. "As in international practice, frequencies will be allocated through auctions, and therefore a package of proposals is being prepared for making appropriate amendments to the legislation. Allocating a low frequency range through an auction will reduce the operators' investment burden, liberalize the telecommunications market and promote the wide-range development of the LTE network," Guluzade said. He informed that the internet access is provided to 80 percent of the country's population and the number of wireless broadband users reaches 73 percent. About 68 percent of Azerbaijani households have computers. He also reminded about Trans-Eurasian Information Super Highway (TASIM) initiative and its contribution to regional development and regional cooperation. The aim of the project is to establish a transnational fiber optic line from Frankfurt to Hong Kong, from Western Europe to East Asia, that will eliminate "digital distinction" and open new economic opportunities for landlocked Eurasian countries. Later, Minister of Communications and Information Technologies of the Islamic Republic of Afghanistan, Shahzad Gul Aryobee stated that the Caspian Innovation Conference is of great importance to the business community and the contribution of digital link solutions to citizens, as many countries in Eurasia have no access to the open sea and existing broadband internet highways at present. The minister also talked about the importance and advantages of ASAN service, known as the Azerbaijani brand in the world. 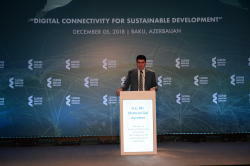 Iranian Minister of Communications and Information Technology Mohammad Javad Azari Jahromi noted that this important conference in Baku will reveal the potential of the region. He emphasized that establishing cooperation ties in ICT sphere between Azerbaijan, Turkey, Russia and Iran, expansion of innovation applications are of global importance, these four states may also take important steps in organizing startups in the region. 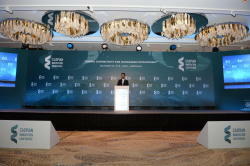 He has called for establishment of strong regional organizations to face the U.S. sanctions during his speech. “Establishing regional organizations and developing cooperation with neighbors are the solution to the sanctions,” he said. Turkish Minister of Transport and Infrastructure Mehmet Cahit Turhan mentioned that the conference will contribute to the exchange of experience of companies participating in the ICT sector in the region and globally. This platform will also be instrumental in new cooperation, he added. Vice President of Huawei Gregory Fox said that the Caspian Innovation Conference is a significant contribution to Azerbaijan's cooperation with Huawei. Huawei has been operating in Azerbaijan for 16 years and has 130 employees here. He said that the Caspian Innovation Conference is an important platform for important discussions on ICT. Speaking about the introduction of 5G services, Fox said that 4.1 billion people worldwide will use LTE services by 2020. Also, according to estimates, the number of users using 5G services in 2021 will reach 740 million. At present, this service is tested in 66 countries. 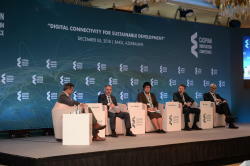 Then, the conference continued its work with plenary sessions on "The Role of Broadband Connection in Sustainable Development: Challenges and Opportunities", "Future of Broadband Internet: 5G and Post". Speaking on “Future of Broadband Internet: 5G and Post”, President of Azercell Telecom LLC, Vahid Mursaliyev informed the conference participants on latest achievements of Azercell in LTE network. “The main goal of our strategy is to improve the quality of mobile communication everywhere, to expand 4G networks in the regions, to provide the latest services and new business solutions, and to launch affordable mobile devices supporting high-speed internet”, he said. The company's president also shared his views on 5G network's prospects which promises positive innovations such as new standard wireless accessory, high speed, easy access to the internet and coverage, more efficient use of energy, and ultra-low latency (30 times more affordable than 4G) used in M2M and IoT applications, saying that the 5G network will set its position on the market for a certain period of time, not at once and Azercell, in turn, is always ready to introduce new technologies, as an approved innovator in Azerbaijan's communications market.